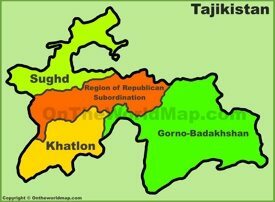 Tajikistan is officially named as the Republic of Tajikistan and located in Central Asia. 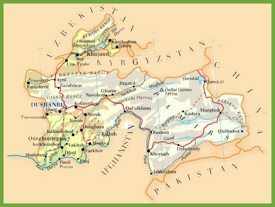 It is a mountainous country bordered by Afghanistan to the south, China to the east, Kyrgyzstan to the north, and Uzbekistan to the west. Warkhan Corridor separates Pakistan that lies to the south. 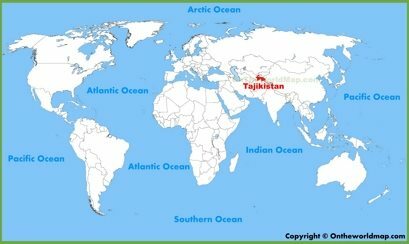 Tajikistan became independent country after the Soviet Union breakup in 1991. 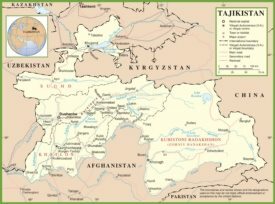 Many Tajikistan’s people still speak Russian, although the official language is Tajik which is a dialect of Modern Persian. 95% of the population are Muslim. It is recognized as the smallest country in Central Asia. Mountains cover 90% of the mainland. The capital city is Dushanbe. 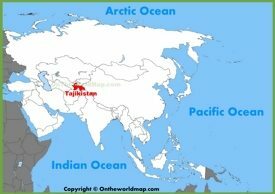 Afghanistan is separated by the Amu Darya and Panj rivers, there are more than 900 rivers in Tajikistan. Area: 55,251 sq mi (143,100 sq km). Largest cities: Dushanbe, Khujand, Kulob, Qurghonteppa, Istaravshan.